Even if history does not repeat itself, some have said it "rhymes a lot". Looking at the Dow Jones in 2013 you could wonder if history will repeat itself, singing another good year. Last year 2013 returned 26.5%, so what does history tell us about possibilities for next year? This graph shows next year's returns (y-axis) as a function of this year's return going back to 1975 (OK, you could say 2013 is now last year and 2014 is this year). More often than not, years of positive returns are followed by another year of more positive returns. Looking back, years with "This Year Return" of over 25% include 1975, 1985, 1995, 1996, and 2003 - these were followed by positive years with average returns of over 18% - 2014 can be the same if the fundamentals are there to support it. In contrast, 1989 and 1999 were followed by years with negative returns. Can future returns can be correlated to the starting PE ratio? 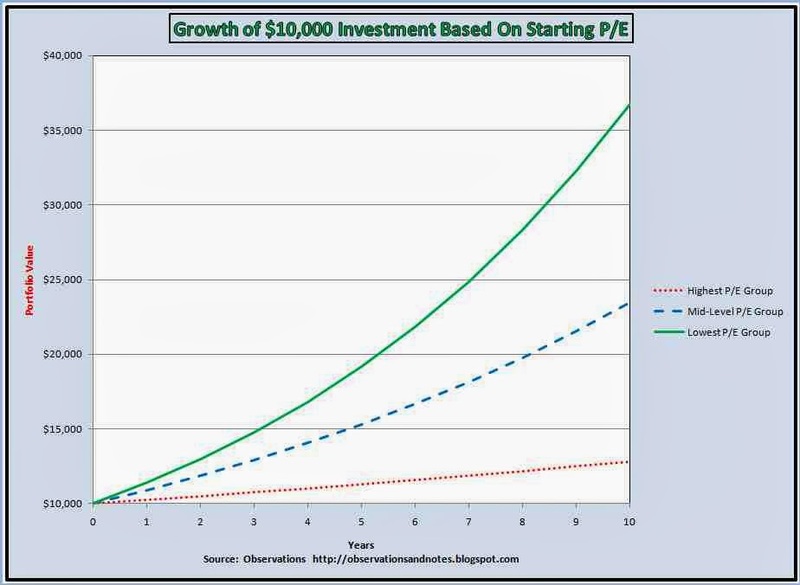 Are you getting into the market when it is expensive, fairly priced, or cheap based on PE? Looking at the historical Dow Jones PE's below, buying in in 1975, 1985 was cheap (PE under the historical average of 15), while in 1995, 1996 and 2003 it was more expensive but still went up the next year. While the next year after 1989 and 1999 were 'losers' (1990 posting -4.3% and 2000 posting -6.2%), the current year PE was moderately to highly expensive relative to an average PE of 15. The starting PE has a stronger influence on the long term returns, as opposed to next year's return. The graph to the right shows that over 10 years, your returns will be cut in half if you buy into an expensive market at the highest PE, compared to buying in at the fair priced average ("mid-level") PE. Similarly your returns will triple if you buy in at the lowest PEs compared the highest PEs. 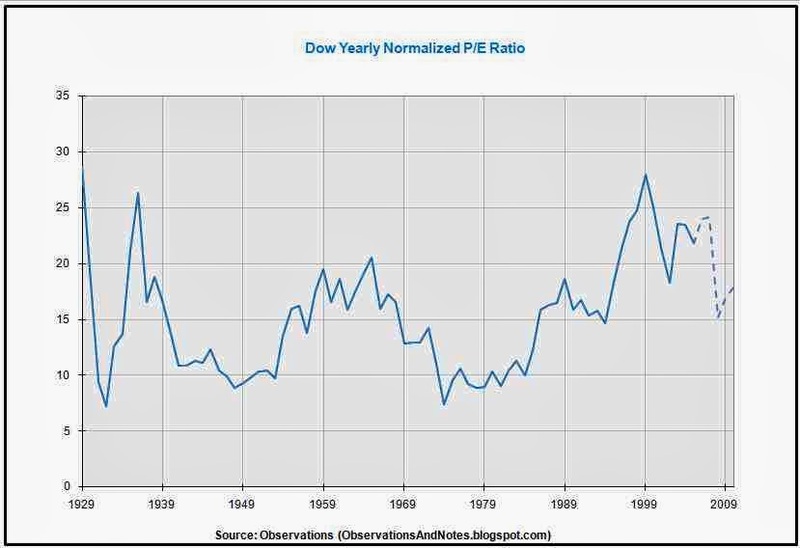 Finishing 2013, the Dow Jones is at a PE of about 17 - a bit overpriced so you could expect average returns over the long term. Looking ahead to 2014 returns, it is most probable that the Dow will continue to climb, being moderately price to start. If earnings continue to grow, and PEs remain average we could have a few more good years. If the PEs climb up into the 20-25 range like they did in the late 1990's, then the party is likely over and you should re-balance you US holdings, take some profit and expect that history will eventually repeat itself with slowing returns and corrections. In Canada, the HXS Horizons S&P 500® Index ETF (ticker HSX) is one option - it seeks to replicate, to the extent possible, the performance of the S&P 500® Index (Total Return), net of expenses. It's MER is 0.15%.